Pure Paisley Consignment Shop located at 3682 George Washington Memorial Hwy, next to the Tidewater Motel is having their grand opening on Saturday, July 23rd, 2011 from 10:00 AM until 2:00 PM. 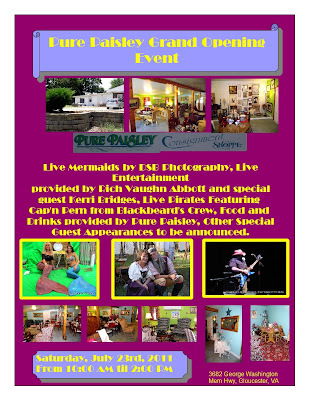 Live mermaids by DSB and DSB Photography will be here along with live entertainment by Rich Vaughn Abbott with special guest Kerri Bridges, Pirates featuring Cap'n Pern and his wife from Blackbeard's Crew and Pernell Taylor Consulting, Madam Tess is a Fortune Teller and from Hampton, VA and there is also going to be a paranormal investigations group coming, SE Virgina Paranormal Investigations. Free food and drinks along with door prizes are also part of this event. Pure Paisley is a new shop here in Gloucester specializing in upper end consignment furniture as well as art. But the prices can not be beat. So come one come all. This will be an incredible time.